Social media is now the #1 activity of Internet users. If you’re not well-versed in social networks, you are missing out on a huge opportunity!! You think it's easy? Don't get me wrong, doing it for yourself is easy, but doing social media for others is another story. I even wrote a blog post about Social Media Fatigue. Social Media can be overwhelming. But if you have the right tools and the right training, you’ll get the hang of it in no time! It's a great opportunity to Learn Blog and Social Media Entrepreneurship today! Have you noticed why many of our social networking sites are often updating their user interface or experience? If you look closely, even google's search results keep changing, though they are more subtle compared to facebook. They're actually not only making our social media experience better but also making social media less intrusive in marketing a product or service, attract leads and eventually generate sales for their clients --the advertisers. That's their area, but the opportunities are also avail for users or netizens like us. We can take advantage of this opportunity by knowing how these processes work and eventually learn about the income generation that comes with it. We can become individual service providers, middle-men-ish agency, or if you're the creative type, do something unique while making money from it of course! 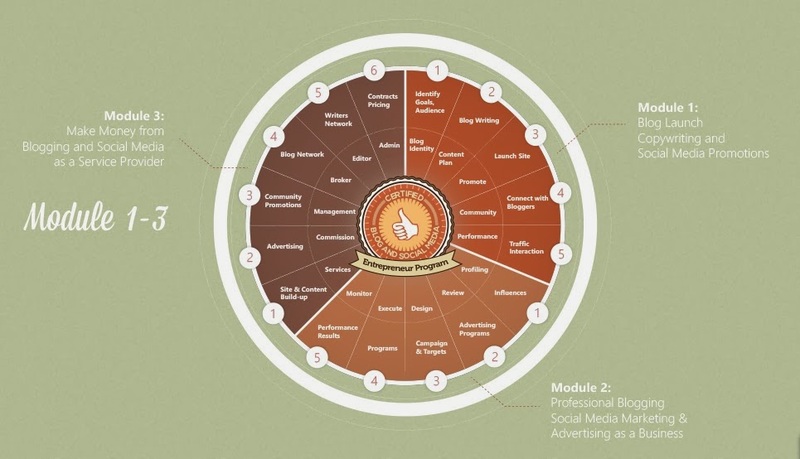 What is the Blog and Social Media Entrepreneur program? Quick history: The program began in 2010 by Digital Filipino, e-Learning Edge & Ateneo de Manila University's - Ateneo Java Wireless Competency Center; the program spans about 3 months or roughly 14 weeks to complete; I took one module of this program around end of 2011 and beginning 2012 and what I like about it is that it all online--you just need a stable Internet Connection. Course Details: You can actually click the image--course pie above to run through the course modules. But it's basically divided into 3 modules: Blog Launch, Copywriting, & Social Media promotions; Professional Blogging, Social Media Marketing and Advertising; and Make Money from Blogging and Social Media as a Service Provider. Enrollment: For this year, enrollment is currently on-going and classes will start on January 25, 2014; so you need to hurry and seize this opportunity!! Expectations: As a program participant, you'll have your own share of work. Each module requires you to engage into a live project. After project completion, these will be used as part of your own business or personal portfolio (so that's 3 projects in the end) and an added benefit is that you can potentially earn from the live project of course! Investment: Total investment for the Blog and Social Media Entrepreneur certification program is at Php25,000.00 (Or pay per module, see the BSM site for more info.). If you asked me that's affordable and to tell you the truth, I'm surprised the price didn't increase since the time I took one module from this program! Target Participants: If you want to build a career or business in social media, then hop-in and join the adventure! This can also be for those who wish to build a "Personality Brand" and use your skills to create campaigns for product/service, clients, advocacies or just for your own personal brand or career. Personally, I've learned a lot from the program despite only taking one module. You not only get to meet and network with new people, (even though it's just online -- you still chat, collaborate or even co-create) but also learn about blogging and social media basics, best practices and industry updates with live application. Register now at http://digitalfilipino.com/bsm/ to enroll!